Note: I built this using Seam 2.2 on JBoss EAP 5.1, but this should work for any JSF 1.2 application using Facelets. 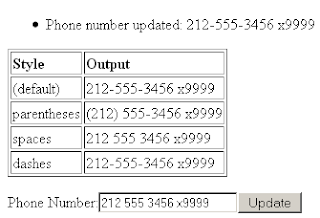 We'll be creating a converter for a class called USAPhoneNumber. There's nothing special about this class, just a POJO with an attribute for each "part" of a US phone number. First we'll create an implementation of javax.faces.convert.Converter. 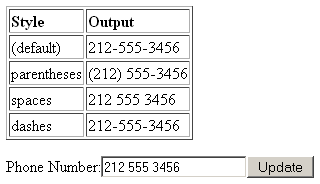 We might want the ability to convert it into a few different styles, such as 212-555-7456, (212) 555-7456, 212 555 7456, etc. To support this, we are creating an attribute called style, which will accept values like parentheses, dashes, and spaces. stringValue = number.getAreaCode() + "-" + number.getPrefix() + "-"
stringValue = number.getAreaCode() + " " + number.getPrefix() + " "
stringValue = "(" + number.getAreaCode() + ") "
throw new ConverterException(new FacesMessage("Unsupported style: "
You must implement java.io.Serializable. After the RENDER RESPONSE phase, JSF serializes the view; in the RENDER RESPONSE phase, it deserializes it. If your converter does not implement Serializable, the attribute(s) (style in this example) will be lost. You must not make your converter a Seam component. Seam provides some handy annotations to save some of the configuration overhead in creating a converter (see section 33.2 in the Seam reference for details). However, if you are using the same converter with different attribute values on the same page, Seam will reuse the same instance with the same attribute values on the entire page. Note: this might be avoidable by using the STATELESS scope, but I haven't tried it. Next, we need to register our converter in faces-config.xml. Note: this is one of those steps that Seam can save for us, but since we aren't making this a Seam component, we need to register the converter manually. Finally, we'll create a tag library descriptor. This step is not strictly necessary, but Eclipse will use it for autocomplete. statusMessages.add(Severity.INFO, "Phone number updated: "
Hopefully, all of this will be a lot easier in future versions of JSF. For those of us stuck on JSF 1.2, though, creating our own converters with attributes can come in handy! Thank Jelly. I am looking for a searchable autoComplete selectonemenu but am un-able to write a custom converter and iterator for such a functionality. Any help? Thanks in advance.